Sussex needed just 17 balls on the fourth day to complete an innings victory over Gloucestershire at Hove. The visitors had resumed on 149-8, although Sussex knew they only required one more wicket as Liam Norwell was unable to bat because of concussion. 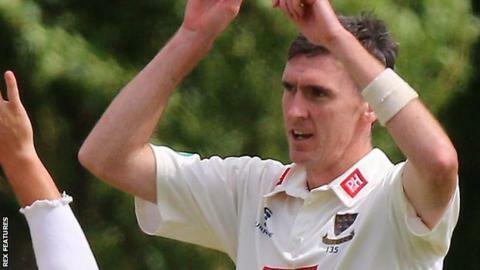 Steve Magoffin (2-18) bowled Jack Taylor, who top-scored with 56, as Gloucestershire were dismissed for 158. The hosts were two runs short of making Sussex, who took a maximum 24 points from the match, bat again. Norwell was struck on the helmet by a Chris Jordan bouncer during Gloucestershire's first innings and did not play any further part in the match. "I'm so pleased for Steve Magoffin, it's been tough, pitches have been hard for him. I've never seen him work so hard in training, he's a great example to the younger bowlers. "The balance of the side hasn't been right this season but having David Wiese I feel we now have that balance and in the last two games we are batting deeper. "We feel confident that if we can put pressure on the sides above us, who knows what might happen with two or three games to go."